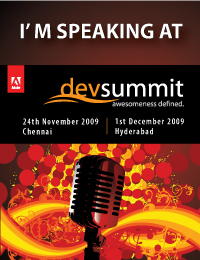 Adobe is conducting 9 online seminars at times that are convenient for people in India. Build an app in a week is intended to teach you about the Adobe® Flash® Platform, including Adobe® Flex®, Adobe® Flash® Builder™, Adobe® AIR®, Adobe® Flash® Player, and how it integrates with Adobe® Creative Suite® 5 technologies. This weeklong event features free, live webinars presented by Adobe technology experts. See live demos and have your questions answered by the experts during interactive Q&A sessions. By attending this e-seminar series you will be able to create your own Rich Internet Application at the end of the week, using all the power of Flash Platform, in combination with the device and technology of your choice. Online live webinars are scheduled events simulcast over the web via Adobe Acrobat Connect Pro. You’ll need a computer with a browser, Adobe Flash player and Internet connection. Voice-Over IP will broadcast over your computer. Access details will be provided once you register.